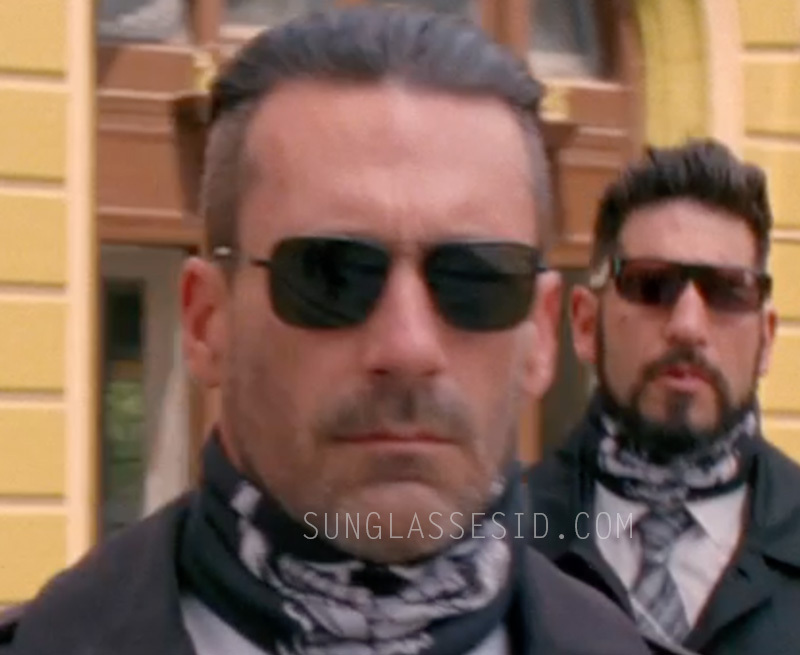 Jon Hamm wearing Tavat Chinook I sunglasses in the movie Baby Driver (2017). The color of the frame is probably black, and the lenses are either grey or vintage grey (we wil try to confirm the correct color). This are the first Tavat sunglasses to be spotted in a film, hopefully we will see more of this brand. Tavat sunglasses are designed in California and made in Italy. In the same film there are other great sunglasses to be spotted, the most popular being Ansel Elgort's Persol PO3132 sunglasses. Ansel also wears a pair of black Wayfarer style sunglasses, blue and red "American Flag" Wayfarer style sunglasses and ic! berlin sunglasses. Other main characters that wear eyeglasses and sunglasses are Kevin Spacey and Jamie Foxx. See all sunglasses in Baby Driver.